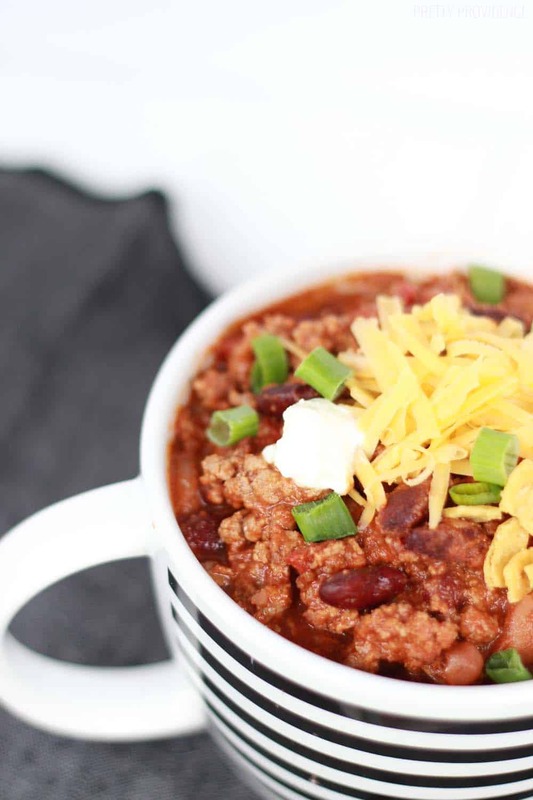 This slow cooker chili is a go-to recipe that I love so much I make it once a week! I kind of feel bad that I haven’t shared this recipe sooner, as it’s literally one of my go-to, make every week recipes. But everything is okay now – here it is! 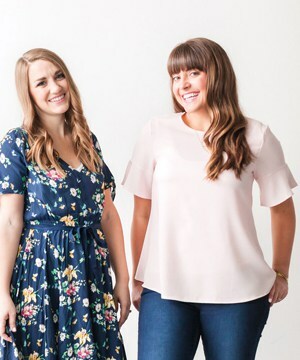 Maybe it will be your go-to recipe too!? The main reason that I go back to this again and again is that it’s sooo easy, so filling, and and obviously delicious. I love it when it’s fresh out of the slow cooker and I love it leftover for lunches. 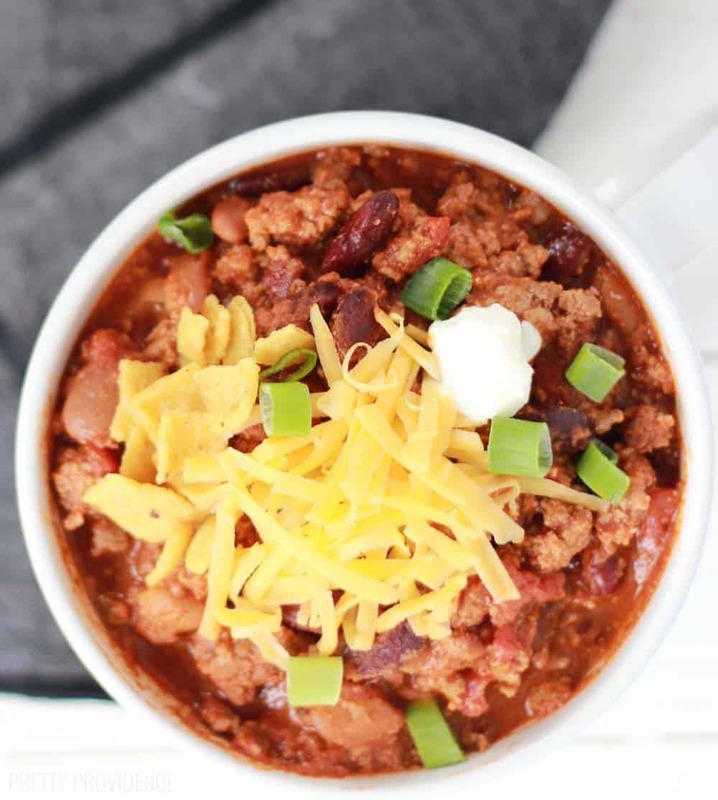 I like to cook ground beef in big batches and freeze it, so that when it’s time to make chili, I just throw it in the slow cooker with the rest of the ingredients and let it simmer! 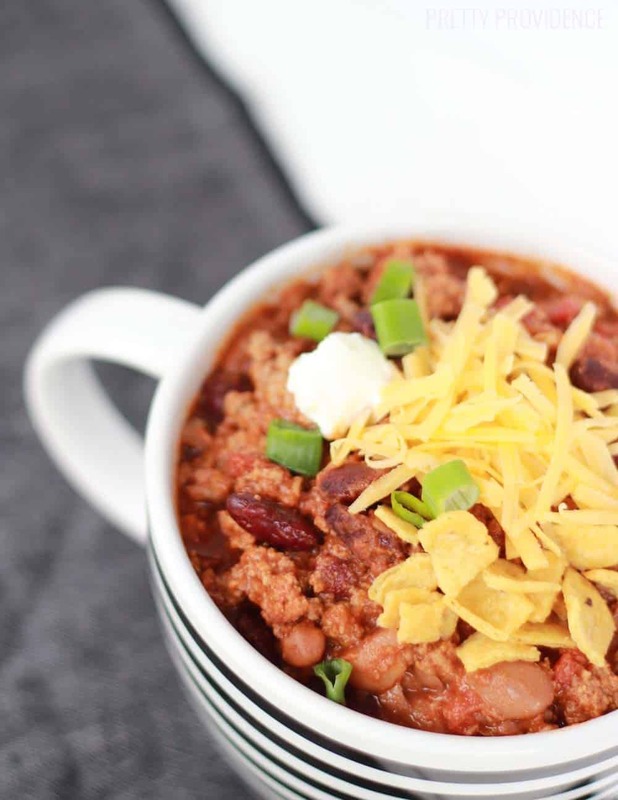 The flavors are awesome with this and it is fun to add your favorite toppings, but it’s so good on it’s own that sometimes I skip the cheese and just eat the chili straight up! That’s when you know it’s real love. Also, if you want to make this more healthy you can swap out the ground beef for ground turkey and then it’s a pretty clean dish! I am not kidding when I tell you I make a big batch of this when I want to lose a few pounds and just eat this for lunch instead of, you know, carbs with cheese and IT TOTALLY WORKS. No, I’m not claiming it’s some miracle fat-burning chili. It’s just that replacing another meal with a super low-carb one that also fills you up and tastes amazing – it’s a no brainer! I hope you’ll try this one. I really can’t give it enough rave reviews. Brown ground beef with minced garlic over medium heat. Add browned ground beef to slow cooker, then stir in tomato sauce, rotel, chili powder, garlic, cumin and salt. Cover with lid and let simmer on low heat for 3 hours. Stir in beans. Cover again and simmer for 20 more minutes. Serve with your favorite toppings! We love to add fritos, cheddar cheese, green onions and ripe avocado. YUM! 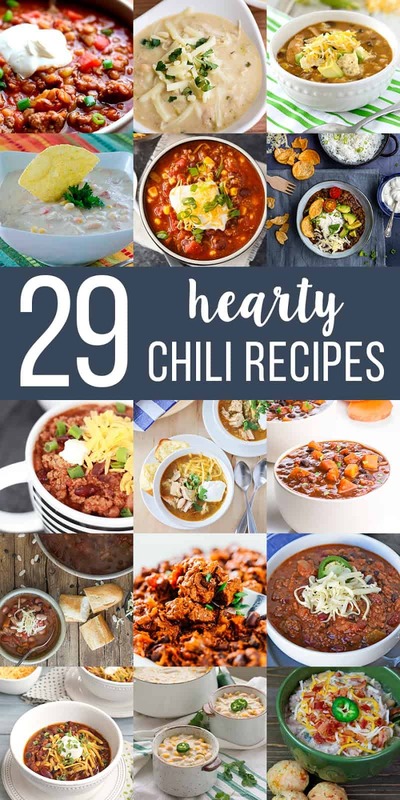 And here are some more chili recipes from my friends that look DELICIOUS! Wow, there are so many good ones to try! 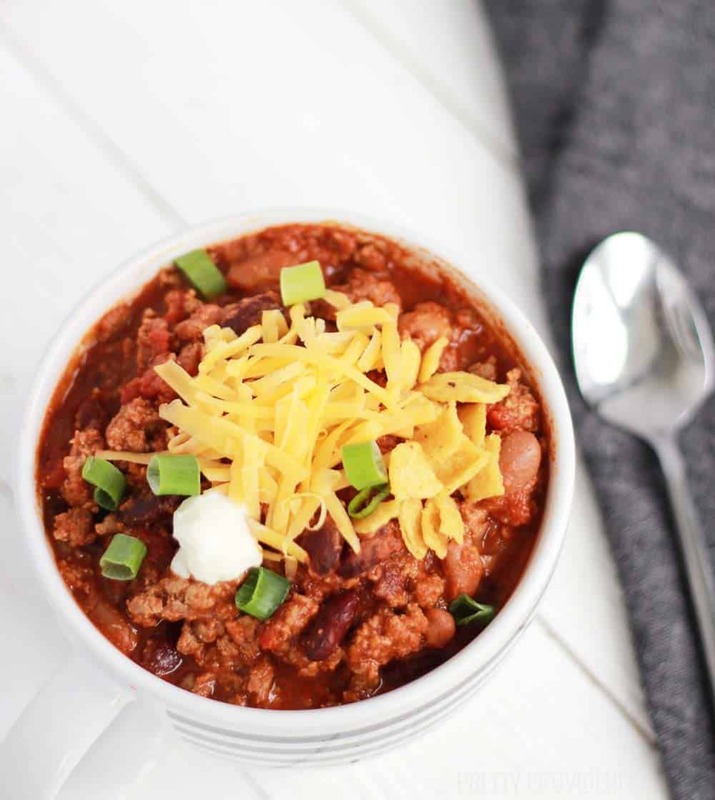 I hope you all have a fabulous National Chili Day! 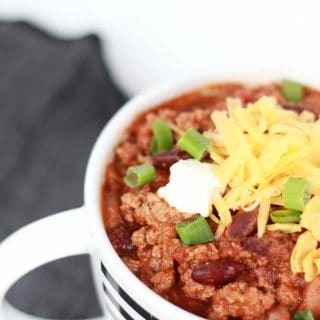 This chili is good! We had to kick it up to high for a bit to get it simmering, but the flavors were great! I We tried it with ground turkey, as that’s what we had on hand. Delish! Yay! So glad you liked it Pamela! Turkey would be great too!